When real estate prices are sky-high, smaller apartments come in as a sigh of relief. A smaller apartment need not necessarily mean a whole lot of adjustments and compromises, in fact there are so many interesting options for space-saving furniture and storage that you can actually make your apartment a fun place full of curious little surprises. Save on that dining table space by using a console table at the end of your couch. This table would double up as your coffee table too. There can be a whole lot of fun options you can consider for seats from comfy arm chairs to bar stools to dante chairs and so on. Another idea is to have a folding dining table. The dining table can be expanded to accommodate more people when needed. Large wall mirrors not only create the illusion of space but also provide a chic finish to the interiors. Having large mirrors on the front of your wardrobe saves on the dressing space as well. Built-in under bed storage has almost become a norm in modern homes. This provides the perfect space for extra linen, towels, comforters, winter-wear and also for bed cushions that need to be kept away for the night. If built-in storage does not sound exciting a storage box with wheels can also do the trick. Just slide it under the bed and the clutter does not bother you anymore. Ottoman beds are the rock stars of space-saving furniture. Trendy and stylish, these little pieces of furniture score big on style and utility. Wall shelves can provide clever storage for almost everything from pictures to showpieces to books to utility items and more. 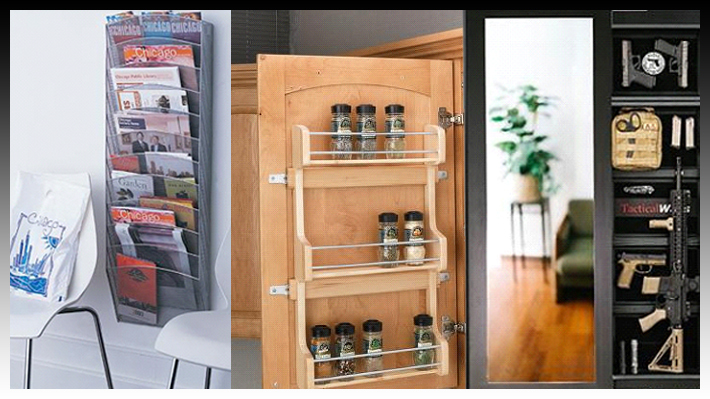 Spice shelves not only help save space but also organize the kitchen well. Do you have a great space saving idea we missed out on? Please share it in the comments below, we’d be happy to expand on our list.